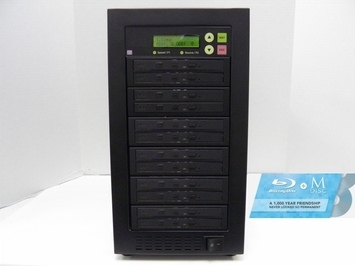 BestDuplicator is proud to present the all-new NANO-series Professional Blu-Ray Duplicator Systems! These systems are purpose built to give you all the benefits of large-scale, high volume duplication, without any of the drawbacks of excessive size and weight restrictions of a standard sized duplicator. We have literally shrunk the system down to nearly half the physical size and weight of comparable target systems. What does this mean to you? Portability - these systems are far more portable for those of you on the go, and in need to be able to travel with your systems at any given time. Even if you're not on the go, these systems take up far less desktop or cabinet space, which may be a restriction for many of you with particular furniture arrangements. Lighter-weight makes them less cumbersome and easier to carry along, transport, or ship anywhere you're headed. Our Smart-USB Connection allows you to connect your duplicator to any PC and burn a master-disc if you don't have the means on the computer you work from. Compare our prices to the Competition currently selling a 5 Target Blu-Ray system of this size for an astounding $2700.00, and you can clearly see how much of a bargain our unit has become! The user-friendly LCD interface provides a simple one step copy function that burns your BD-R, BD-RE, DVD or CD blank discs at an optimal speed producing from 1 to 11 (depending on your Target Model) copies every burn cycle. Burning speeds are fully user-adjustable and other standard menu features are available, as well as settings for more advanced users. A computer or external device is not required at all to use the unit. Different CD, DVD, and Blu-Ray formats are automatically detected to allow stable and secure buffer speeds while under run protected burning without the added trouble or stress from a computer to handle such functions. Compared to older models, this one comes built with the latest state of the art drives (BestDuplicator Certified), giving you much faster maximum burn speeds. With the all new BestDuplicator 128MB Controller, it has become a no-brainer to entrust your mass-production needs to us.